HALF HOUR PRIVATE TOURS - Fun and Informative!! - Each tour fee includes up to 10 persons, additional participants may be added with drop down tab when ordering! For for all Alpaca Enthusiasts; Individuals, Couples, Families, Focus and School Groups. Many people today are not aware of how we attain our resources, food, and clothing... One way to facilitate an understanding is to introduce them to the Alpaca as one source of fiber for production of clothing. A typical, private 1/2 hour tour will include a welcome and an age-appropriate farm orientation, guided to learn about how we operate the farm, and a "meet and greet" visit with our alpaca. Afterwards you are welcome to spend as much time as you like in our viewing area and gift shop as you like during our business hours! 10 am to 4 pm. Please specifiy in the Notes section at check-out your preferred dates and time, and the number of adults and children in group*. A picnic area is available in our viewing area, and gift shop for your enjoyment. 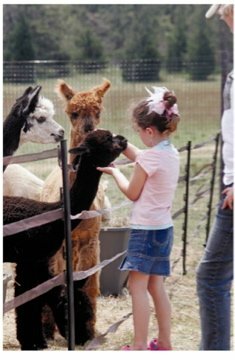 For a more interactive, hands-on activity, please consider the Alpaca Discovery Program. Click here for further information. *One adult minimum, must be a paid participant for every 10 children.